EAC help businesses keep the pollutants they generate in check so that employees have a better and healthier working environment as well as ensuring that neighbors are not inconvenienced with bad air around them and can be easily configured and incorporated into various types of exhaust system of business. Advanced Research Group Co., Ltd.
Our property management system, HotSoft 8, consists of fully-integrated modules and provides features that support all kinds of businesses, from hostels to hotel chains. You only pay for the functions you need. Our products are authentic Japanese Matcha which are cultivated and manufactured by the traditional methods. Therefore, we believe this is a big appeal point for consumers to mesmerize consumers. Also, we have established Bangkok office in 2017 and can support customers not only in Thailand but also other SEA countries. AK & J Textile Co., Ltd.
With over 30 years of experience in the textile manufacturing for HOTELS, we always support our customer with "The Best Quality" and wide range of product such as "Bed linen, Towel, Duvet and Pillow." Japanese made beans paste of soda pop flavor. Akatsuki Electric Mfg. Co., Ltd.
Foreign currency exchange machine allows foreign travelers, returned travelers, or foreign workers to exchange their foreign currency to local currency. It achieves over 99% of identification rate (the highest level of this industry), corresponding to 120 currencies. Japan No.1 Kiosk for Hotel Self-Check In & Out. ASTA’s HQ- Almex establishes for more than 50 years, expert in providing IT solutions to Hospitality business operation. For F&B, we have self-ordering solution for E-menu, Kitchen Display System, Self-Ordering Kiosk & POS. ASI FrontDesk - Comprehensive Property Management System (PMS). Our Hotel Software which is Affordable, Dynamic and Easy-to-Use. With 5000+ Clients in 169 Countries Worldwide. 24/7 Technical Support Available. This is a long-lasting type of botanical interior decoration. Dried flowers and/or preserved flowers are soaked in a bottle filled special oil developed by our company. Asia Engineering Pac Co., Ltd.
To Cut Meat without bone or Soft Fruit with some fiber. Ex. Pineapple /Mango /Jelly. User can adjust the speed of Cylinder to got different length of product from 2~30mm. MILLESIME Chocolates is a concept from Best Grand Crus Classés Wines adapted to unique special Cocoa Beans. A bean-to-bar manufacturer oversees the chocolate production chain, from sourcing the beans to making the actual bars. MILLESIME Chocolates are for Passionate Chocolate Lovers and Connoisseurs. Inspired by Asian Culinary, Athena Marble Bowls are perfect for presenting fusion fine food. The gifted natural pattern varies from one to others, creating irresistible uniqueness to table art. At Backaldrin, we believe in the importance of service, so we provide you with the solutions you need in the baking world every day. Beyond our high-quality products, as a Backaldrin customer, you have a range of services at your disposal. Duck Meat Ball made with premium quality duck meat cooked in Japanese style. Perfect for a finger food to a main dish in every occasion. Panasonic Hotel solution provides seamless communication with easy operation for the users. With built-in PMS interface, the customer can maximize the usage of telecommunication system at ease as Panasonic PBX also supports world class PMS software. Bara Stainless Work Co., Ltd.
Bara Stainless Work Co.,Ltd. is leading manufacturer of cutlery and hollowware for major clients in Europe, America and Asia. The Skilled workforce is well trained in high standard mirror polishing, sandblasting, satin finishing and hammering. We has our own in house design team that design product according to customer's requirement. Be Media Focus (Thailand) Co., Ltd.
Food Focus Thailand is a trade magazine, distributed to Food&Beverage professionals in Thailand. We provide a unique niche of well-balanced coverage, including processing & packaging innovation, quality measurement in terms of physical, chemical, and microbiological basis, standards & regulations, logistics & supply chain management, as well as marketing issues. The only appointed roaster for WCE Taiwan roasting championship in 2017-2019. The experience of tasting the unique flavour of Beluga caviar, exalting your sight with eggs of big size it is among the most exclusive and delicious gastronomic refinements. Panomrung is the rice delivery service brand that provides a turnkey service. It’s a new concept that controls quality of the entire products, from production to consumption. Consistent rice quality is the heart of Panomrung brand. Besides of the exclusive distribution in Thailand of Catunambu, Spanish Premium Coffee since 1897, we also offer (franchise) coffee concepts like roasting- and distribution partner programs. Our coffee concepts are supported with a perfect range of coffee machines including 5 year warranty! Looking forward welcoming you at stand P27. SYNESSO is now available in Thailand exclusively at CoffeeWORKS! Comanche International Public Co., Ltd.
COMANCHE INTERNATIONAL PLC. is an Information Technology Company that specializes in providing Truly Seamless System Integration Solutions for the hospitality industry. Comanche’s fulfills hoteliers’ requirements with its full range of feature rich modules including Front office, Point of Sale, Back office, Interface systems, Mobility, Business Intelligence Solutions and more. Comptoir Francais Du Vin Co., Ltd. Select which one is your favorite types of wine to bring to a special moment. Consorzio Di Tutela Vini "D.O.P. Salice Salentino" e "Salento IGP"
Association of wine producers, bottlers and winegrowers for the protection and promotion of autochthonous grapes in the territories of the Italian provinces of Lecce and Brindisi. Production of 190 thousands tons of grapes, 140 hectoliters of wine. CP-Meiji Co., Ltd. is leader for pasteurized milk in Japan, Singapore and Thailand. Manufacturing and Distribution 100% pure fresh milk. Which are meticulously selected form nature. Together with modern Japan quality standard technology by products are retaining their nutritious benefits quality with Fresh, rich and delicious taste. 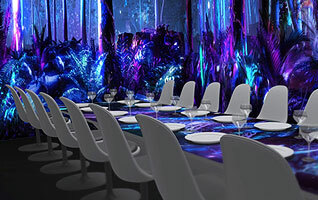 Dine4D by CRAVE is the first 360° immersive dining experience with full interactive table. A truly magical experience with entire ambience that will be changed according to every dish served. Elevate your business to the next level today with Dine4D for your distinguished guests and VIPs. 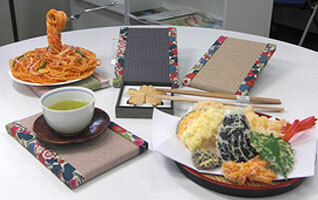 Creative Food Solutions Co., Ltd. Convenient Frozen Handcraft Cakes that simplified your operation. CTI Food Supply Co., Ltd.
Dapper General Apparel Co., Ltd.
Lee Denim look long sleeves chef jacket has a modern design and is comfortable to wear. Our denim look fabric is light and last longer after many washes. Quick release press buttons are easy for chef to wear and take off. Darling Mattress, Thailand’s Leading Manufacturer of Genuine World Renowned “Pocket Spring” from Swiss Technology for Forefront Hospitality Industry. Our designed Barrel Pocketed Coil Spring (BPS) of lightweight high-tensile strength steel, individually encased in tear-resistant pockets, contours to the applied weight, offering ultimate experiences and maximum comfort for hotel prestige guests. Doi Chaang Franchise Management Co., Ltd.
Doi Chaang Coffee Original Co., Ltd. Producer and distributor of Doi Chaang Coffee, specialty, single origin, high quality Arabica coffee. Doi Chaang Coffee is only grown and produced in Baan Doi Chang, Wawee district, Mae Suai, Chiang Rai. Dongguan City Glory Tins Manufactory Co., Ltd.
High quality packaging tin boxes, which are applied for chocolate, candies, cookies, gift, cosmetics, tea, households, etc. New vintage of Chateau de Potiron wines are available now and launching at Food and Hotel Thailand 2018 with the very special price. Please visit us at booth R-6 for tasting. EASYFO is a Hotel Software Company in Thailand, established in 1998 by a group of hotelier and programmer who is willing to find an alternative choice to support hotel operation EASYFO has cover for all hotel operation System with full modules. Our mussels are sustainably farmed in the pristine waters of the top of New Zealand’s South Island. Euro-Asia Electrostatic Precipitator Technology Co., Ltd.
Euro Asia technology EAN Series Electrostatic Precipitators use induced electrostatic charge to charge and collect passing particles which provides effective containment of dust, oil, grease and smoke in a kitchen exhaust system. The units made of solid construction and heavy-duty collection plates that deliver consistent performance at upto 99% efficiency. FB Food Service (2017) Co., Ltd.
FB Food service uses modern technology. The system meets international standards. Carpigiani Professional countertop batch freezer, ideal for catering, hotel and restaurants. Easy to operate with control switch to start the production, for extraction, cleaning and stop. Automatic control of the gelato consistency. One piece beater with three blades. Drawing cut for optimal nutrient retention and cut products that stay fresher for longer. Foshan Shunde Yingshunao Electric Appliance Industry Co., Ltd.
AOPA hot pot induction cooktop & Korean BBQ grill table. Fukushima International (Thailand) Co., Ltd. Global Food Supply Co., Ltd. Premium and top quality traditional pastry - frozen tarts and cakes from France. Great System (Thailand) Co., Ltd.
Great System (Thailand) Co.,Ltd. Hotel door lock system /Digital door lock / Energy saving system and accessory for hotel. Great Lock, is the Ranked 1 in 3 most used digital door lock, best-known in the hotel door lock system. 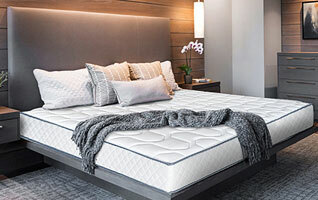 ALICE Natural Latex mattress design to support your body with 7" of compressed latex top with 2" of 7 zones natural latex to give you appropriate body support. Also prevent you from dust, mites and bacteria which will cause you an allergy. High quality coffee in beans, capsules and ground. Be-Tech VISION II RFID series is the latest electronic locks that use simple, fashionable and comfortable design. Be-Tech VISION II RFID series is especially designed for the modern and fashionable hotels with the desire of make sure the lock perfectly blends into the fashionable hotel environment. Fully configurable PMS that enables any sized hotel/group to manage their operations efficiently. Cloud based, provides a single system with interfaces to OTAs, GDS, and third party systems. Real-time updates, incorporating a comprehensive rate/availability management tool it ensures revenue is maximised at every opportunity. "Hansamin" Korean Red Ginseng extract is concentrated active constituent from six-year-old red ginseng. Korean red ginseng is a popular Aphrodisiac, because it specifically helps bodily stamina and blood flow. Enjoy the best gift for your health from Korean red ginseng! Dialock RFID Access Management Solutions. "Shio koji" is a Japanese fermented condiment, mainly used as a marinade. "Shio Koji" contains active enzymes which soften meat and bring out UMAMI or flavor in the other ingredients. Many kind of Hand trucks : reduce noise hand truck, Maid trolley, Janitor Trolley, stainless steel material Structure grade304:Damp-proof,Anti rust, Stackable & Connectable dolly, Aluminum dolly, Ladder, shelf, many kind of caster wheels : Rubber, Polyurethane, Nylon, Heavy duty for all kinds of industry such as Food industry for cold storage commercial kitchen & Food service equipment, Industrial & factory food. A high-grade water extractor exclusively used for swimsuit. Extract most of water from a wet swimsuit in about 5 seconds. Face towels, T-shirts are also available. Main customers are fitness club, hotel, leisure pool, public swimming pool. Share in Japan: 99% Total deliveries 10,000 units. WE MAKE THE WORLD'S BEST HOTEL BEDS. Slumberland Hotel Beds Collection is made with combination of luxurious design and outstanding sleep comfort. We are one of the most reputable brands of institutional bedding products, using the exclusive technology and expertise developed over the years..
HOBART Thailand and Indochina office has been established with Warehouse and the Spare Parts Center in objectives to support distribution network throughout the region of Thailand and CLMV Countries which consist of Cambodia, Laos, Myanmar and Vietnam upon economic expansion and commit in quality genuine profession as stated “HOBART proudly supporter you” always. 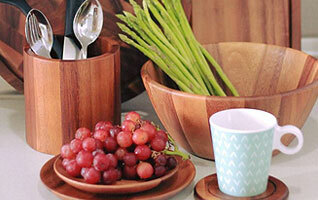 Housewares 2000 Co., Ltd. and our production, produces quality housewares items from sustainable wood source. Huaian Huaxia Towel Co., Ltd.
HUAIAN HUAXIA TOWEL CO.,LTD is a manufacturer and trader of hotel linen, including towels, bathrobes, bedding linen and F&B linen. Huaian Liqun Import & Export Trade Co.,Ltd. Huaian Liqun Weaving Co., Ltd established in 2007, is a manufacturer and trader of hotel linen, including towels, bathrobes, bedding linen and F&B linen. Claire LED Pillar candle is a real-candle-light effect LED candle. It is non-distinguishable from real candle light. It's beauty and at the same time 100% safety for your hotel and restaurant. Material is from authentic wax and using battery-operated LED candles, so it can be conveniently placed without wiring. We unite all of the great ceramic around the world for your unique experience in any ceramic flooring and bathroom products. Italasia Trading (Thailand) Co., Ltd.
SENSA -enjoying wine can be that easy. SENSA takes the complexity out of modern wine enjoyment because every glass shape fits exactly one aroma or wine style. Each glass has particular characteristics in a typical aroma range, regardless of whether you are serving red wine, white wine or rosé. J&P Jasco Products (Thailand) Co., Ltd. Through countless years of experience on Food Service Equipment, we can assure customers that we are capable of providing best price, high quality products ranging from small wares, table top, bar supplies, bakeware, buffet wares to cookware. Jaspal & Sons Co., Ltd. Through our iconic brand of Sealy Posturepedic and Santas Home, we are recognized as a hotel luxury standard for upscale hospitality sector. Our comprehensive in-house R&D facility assures world standards and constant innovation enables us to produce and deliver an expansive range of bedding, bed-bath linen, fiber fill products and accessories. Johnson Health Tech (Thailand) Co., Ltd. Refined ergonomics, superior comfort, streamlined serviceability and all -original programming with a led wrap that uses vibrant colors to precisely gauge effort and keep guests on track for their goals. Blades are made in JAPAN !! This razor has 3 blade & neck pivoting system !! This is the first time to launch to the hotel industry in INODENESIA !! K.H.T. Central Supply Co., Ltd.
Commercial and Industrial Laundry Equipment for all laundry's need. New on board is Coin operated washers and dryers with attractive pricing. The Professional Efficiency Espresso Machine 2G with integrated rotative pump, copper boiler, electric heating, volumetric dosing, thermosyphon system with adjustable flow control, boiler temperature controlled by PID system, heating element protection and display for easy to use. You can choose your style with special customize color in FHT2018 only. This is ceremonial glade Matcha in JAPAN. Our products all grown Kagoshima JAPAN. We have 4 kinds Matcha First-class, Premium, Standard, Economy. If you need more informations, please contact to us. Keith & Kym Concept Co., Ltd.
Bfooding is high-end food service products, specialising in disposable items and packaging. We leverage our resources in China to provide quality. The diversity of materials we use allows us to meet various kinds of inquiries. Our products can be made up of Polylactic Acid (PLA), bamboo, wood, and sugarcane fiber. ‘KIOSQUE’ is the leading brand and specialize in Restaurant Management Software. We have more than 600 customers in Thailand and Oversea. Our products are Restaurant / Fast Food / Android Ordering /Member System, Head Office System, Inventory Control and Cost Management System. Kiwi & Kom-Kom Products Co., Ltd.
Our knives are multipurpose kitchen knives. We promote the right selection of kitchen knife that is suitable for every occasion usage in order to create wonderful menus for sharing the happiness and healthiness with your beloved and family members. This year we proudly present new line of mobile cooking station to surprise your guest with romantic dinner on the terrace sunset. Kondo Honey Factory Co., Ltd.
Japan is such a beautiful country. People can enjoy the nature and see various kinds of flowers for four seasons. This product is made by blending honey harvested from these flowers. We carefully blend these so as to optimize their tastes and aromas. KPB International Marketing Co., Ltd.
Kunshan Nabo Container Technology Co. Ltd. The Exotic AngelLight:Exo-10, LED Rechargeable Table Lamp, is the latest development with unique design in combining the beauty of the natural Stone and the modern look of stainless steel. Excellent object for fine dining table, roof top outlet or at the lobby. Lernith Inter is an exclusive distributor of Groupe GM. A leading international player in the guest amenity industry for 40 years in over 70 countries. We design, produce and distribute cosmetics and accessories for hospitality industry. Groupe GM offers more than 30 recognised international brands and unique customisation for hoteliers. MARUZEN "GAS FRYER" Excellent thermal efficienvy and Economy MARUZEN’S No.1 hit Equipment ! MARVICE PAGING SYSTEMS was designed to help cafe, restaurant, food service, etc. to manage incoming customers efficiently and distinctly. RUBBERMAID THAILAND by MATERIAL WORLD CO., LTD. With our long-standing experience in Logistics and Warehouse Solution, so we have been award from Rubbermaid Commercial Products(RCP) to be the main distribution center to pass on its quality products in Cleaning & Material Equipment, Decorative Refuse, Food Services, Safety and Washroom Products. Beni-imo Powder, made from 100% okinawa sweet potato. It is famous in Japan as super-food material. With its delicious extremely sweet taste and intense purple color, it can be used for any cakes, bread, pastries, ice cream. Midori Anzen (Thailand) Co., Ltd.
Slip Resistance Shoes - Suit for Oily & Watery Floor - Light Weight - Comfortable - Authentic Japanese Brand - No.1 Best Seller for Food Industry in Japan. Odours can be hard to eliminate Even in a well ventilated room it may be difficult to remove nuisance odours. With OZ 1000 & OZ 2000 form JIMCO A/S you can permantly solve any kind of odour problems without using chemicals.The odour will not return. N2ICE Co., Ltd is an importer of ice cream machines, Soft Ice Cream Machine, Ice cream equipment and bakery equipment also accessories for the opening of ice cream and bakery shops, Provide also professional ice cream course. We have 10 Years' experience in ice cream business. NeoScent is part of the NeoN Group and is the leader in scent branding and ambient scenting in Thailand and South East Asia. NeoScent is able to provide a complete scenting service from designing a scent to compliment the location through to successful installation and regular monthly service. Newton Food Equipment Co., Ltd.
CARPIGIANI 161 G SP, The only compact, self-pasteurizing soft gelato machine in the word. Compact : Now even cafes, restaurants, pastry shops, and gelato soft shops with limited space can delight customers with an excellent gelato or a delicious frozen yogurt. Thai wooden manufacturer with over 20 years experience in producing premium quality kitchenware and tableware. We specialize in OEM with low MOQ for the Horeca industry and have worked with major Hotels and restaurants in South East Asia. We provide laser engraving services for clients requirements. OK Nakornpathom Food Co., Ltd. Frozen Fruits and Vegetables. WE can OEM any FROZEN Tropical fruits and vegetables as customer's request. Made from Uji-Maccha leaves. Since this product is not a Maccha extract but fully made from Maccha tea itself, it allows you to intake tea’s nutrients entirely. P J Services (Thailand) Co., Ltd.
State of the art design. One glass is a quality Italian wine comes in a 100% Single Serve with innovative in packaging: lightweight, unbreakable and pocket-size. We supply a wide range of freshly-baked or frozen FRENCH BREAD, VIENNOISERIE and PASTRY, handmade in our bakery kitchen in Bangkok, and the 'NEW ZEALAND NATURAL' range of premium ICE CREAM-SORBET-FROZEN YOGHURT, made in Auckland (NZ). Nationwide distribution with offices in Bangkok, Phuket, ChiangMai, KhonKaen to Hotels, Restaurants, Cafes and Supermarkets. Compact desktop 'Ticket Vending Machine' useful for Food Court operation. By combining with card system. Fully Cashless operation is available. WASSTEX : The Hotel Wood Floor - Waterproof 100% & Anti-Termite Eco-Wood Floor. - Solved the problem of water damaged wood floor from customer or leakage. - Easy to renovate for Hotel & Service Apartment - Good for Long term Investment. - Anti Slip, Stronger than engineer floor with 10 Years Warranty. Pluto Ice Cream Co., Ltd.
Italian Artisan Gelato and Ice Creams Products! Drinks Supply : 3 and 5 Kinds, of beverages, suach as lced milk tea, coffee, chocolate, hot instant powder drink and others raw material storage tank 3 and 5 tanks with capacity 1.6 kg. The current trend of "Street Food" is making it’s way into menus in restaurants, hotels, bars and lounges. White album, is a simple collection of shapes designed to give a modern touch to the "Kitchen to Table" trend and presentation of "Street Food". The tried and tested hybrid oven combination impingement and microwave technology makes baking, roasting and cooking up to 20 times faster. Perfect browning and crusting to produce an excellent taste. Oval hot plate with wooden base. Suitable for every hot dish menu. The plate made from Iron, so it could maintain hot temperature for long time. Here at Quescrem we are specialists in the production of authentic cream cheese. We use unique ingredients ordering nutritional and functional values that set us apart from other producers on the market. Our top quality products have also received IFS certification (International Featured Standards). As IoT became a hot topic nowadays,different wireless technologies that supports remote data transfer,control&sensing such as RFID, Wi-Fi,Bluetooth,and also cellular networks have been evolved to add intelligence at various levels in hotel,ADEL’s lock was an innovative wireless door lock technology to made the hotel management smarter and easilier. We are one of largest manufacturer for Non dairy creamer in China, we have HALAL, KOSHER, ISO, FDA, HACCP etc. Our production capacity around 5000tons per Month, and our goods have been exporting to more than 50 Countries.Our main goods are Non dairy creamer, MCT powder, Pudding powder, Foaming creamer, Whipping cream powder. The all-new Kuvings EVO820 Whole Slow Juicer is so easy to use. It comes with the new O shape flip gate feeder. The latest in cold press juicing technology that we have designed and invented. Watch this short 60 sec video to see the tech come to life. High quality 12 inch meat slicer which is made of aluminum alloy and painted. Reasonable structure and fashionable design. It can be used to cut frozen meat, ham, sausage and cheese ect. Machine's power is 420W. CE, LFGB, ETL, ROHS certificates approval, which had been exported to many countries. The Eco Friendly Nano Cleaner derivated from Natural. Siam Tin Food Products Co., Ltd.
Ready for cooking high quality Thai curry sauce to be used as soup base for hotel & catering service. Prepared for any skill level cooker to create menu by simply add meat and vegetable. Simmons Bedding & Furniture (Thailand) Co., Ltd.
With 148 years of heritage, Simmons is the forerunner in technological innovations, which include the Individual Pocketed Coils® with the Do-Not-Disturb® benefit. Prestigious hoteliers around the world select Simmons because they trust only the top name in sleep to provide premium rest to their discerning guests. SKGF Trading (2002) Co., Ltd.
BOH Earl Grey, a classic black tea blend with a hint of bergamot. Aromatic with a distinct citrus flavour, a truly refreshing tea. Since 1929, British pioneer J.A. Russell transformed a tract of land in Cameron Highlands into Malaysia’s first highland tea garden. A superb environment to produce distinctive teas. Harmonized 24 kinds of Japanese domestic vegetables and fruit smoothies. Harmonized 22 kinds of Japanese domestic vegetables, primarily young barley leaves, kale vegetable powder and 2 kinds of Japanese domestic fruits with dietary fiber, oligosaccharide and lactic acid bacteria. No colorant used. Dream Heaven offers the ultimate mattress perfection and is a showcase of finest raw materials with 400 GSM knitted fabric designed in Belgium, Cool Gel Memory Foam, Latex, High Density Foam combined with Pocket Spring to give your guest the most luxurious sleep experience. Weihenstephan Brewery - after nearly a thousand years - still stands upon the Weihenstephan Hill, proud of its quality and its tradition and conscious of its position as the oldest existing brewery in the world! World Beer Award: Germany - Gold, and many more. Springmate, the mattress of choice for luxury hotels and resorts, we helps guests sleep comfortably and undisturbed by each other's movements. Our mattress provides a sumptuously soft support and an extra protection from dust mites, one of the main causes of allergies, with anti-dust mite cover fabric. Can be nested for storage. Has a built-in card slot for easy reference. Can be locked with your own lock. Container can also be secured with our disposable No. 1811 Security pin (Sold separately).Fits with our No. 1806T Trolley. Material Complies with FDA standards. SunLee's Jasmine Rice maintains at least 96% pure Jasmine Rice to total weight which is higher than the Industrial Standard of 92% purity call for a common standard for export or domestic used. Famous ten companies in Ueno and Asakusa in Tokyo are exhibiting their products including the ones employed in Japan’s prestige shops. They also introduce traditional crafts products utilizing traditional skills and techniques that have been cultivated in “SHITAMACHI” (where Ueno & Asakusa is). Pola Pola : READY TO EAT SOUP IN RETORT POUCH. A choice for every need. Wine, Ice-Cream, Meat and Pastry. Excellent raw materials, all quality of Made in Italy and last technology news. Vacuum Blender can keep the air pressure inside the bottle as low as the top of Mt.Everest (0.3 atm). Under vacuumed state with little oxygen, foods can keep freshness and original taste longer. Also introduce Collagen Ion Hair Dryer which can dry hair and protect moisture in hair and skin. Thai Thermo Dynamics Co., Ltd.
TFB Boxes are made in Germany from EPP for use in the Hospitality; Food and Catering Industry ; Keep Food Cool, Fresh or Hot; Robust, durable, lightweight, hygienic and dishwasher proof and 100 % recyclable. EU Certified food grade with insulation attributes from - 40 to + 120 °C. EUROFOOD, food solution for professional, who provides food ingredient products to the Thai Market such as Ayam brand, Divella, Alce Nero, Espuna, Negroni, Paysan Breton, Risao Gall, Andros, Bonne Maman, and etc. Laundry equipment from Japan. We'd like to propose "JAPAN QUALITY" washing to Thailand. Tokyo SME Support Center provide you with meeting chances with 12+ Tokyo excellent companies at our pavilion where you will find various unique TOKYO products. We welcome your visit to our pavilion at booth No.H1-16 in Hall103. 12 TOKYO excellent companies are ready to make business discussion during the period and onward. The very first time Josper Charcoal oven, the inventer and leader of Charcoal oven technology, exhibits at Food and Hotel Thailand 2018 with official partner TPN GROUP. Showing benefits and new possibilities the total cooking solution all in one unit. Awning system with accessories for outdoor use with outdoor fabrics. "LAPOVO” is Green Smoothie for diet support. Characteristics of this Smoothie is below. Contain 188 types of plant enzymes. Contain 21 types of superfoods recommended by the association. Contain plenty of other active ingredients. The calories is 32 kcal. Ultrasonic humidifier GREEN MISTER for open showcase in super market and salad bar in restaurant. It supplies ample mist to every corner of the showcase to keep the products freshness and reduces distress goods. Comes equipped with germicidal device to enhance the hygiene humidification. Controllable like your hand. Natural as your thoughts. Intelligent and connected. This is CHEFTOP MIND.Maps™ PLUS by UNOX, the professional oven that breaks down every barrier between your ideas and their achievement. With one gesture. Visit USMEF booth Q11 to taste high quality U.S. beef & pork! VC Fabric is an expert in soft furnishing project since 1980. We promise to deliver the professional works by our 38 years of experience. Our selected products for hospitality project are Flame Retardant curtain, Silicone Blackout curtain, Roman blind, roller blind and others essential items to enhance your hospitality. Incredible Rich Sesame Paste certified with JAS, EU, USDA organic. This is so rare kinds of sesame. Roasted by Japanese original tecnique and super high temperature until rich flavour and fragrant taste. After making paste with ceramic mill 3 times slowly. The rich flavour and smooth paste. ADR acoustic door products are suitable for a wide range of applications from residences to professional studios. Whether it is household entrance or a music practice room. Our milk is pasteurized (ESL), with machinery and technology from Europe, therefore, our milk keeps fresh for longer periods of time. Our milk is premium quality as we select only the top grade rather than mix different grades of milk and 100% pure milk with no additives. The New U50 undercounter warewasher is built with highest German quality standards and designed with simplicity and practicality in mind, fitting the needs of professionals in search of affordable and effective warewashing solutions. Users can trust its level of efficiency, reliability and cleaning performance. Wise Promotion (Thailand) Co., Ltd.
Wongwat Limited Partnership is a professional importer and supplier of hotel and hospitality products and amenities. We are able to manage product qualities and offer our customers the highest quality products. World Of Food Co., Ltd.
WORLD OF FOOD Co., Ltd., importer and distributor of Quality, Sustainable and Economical foods, have great pleasure in introducing IRONGATE PREMIUM WAGYU BEEF. IRONGATE produce exceptional quality and unique tasting Wagyu beef in the Great Southern region of Western Australia, known for it’s pure, lush and pristine environment. Yokoi's edo-tannen-su is the cooking vinegar. From the great epic to the legendary Craft Cider “Sida” the first unfiltered apple cider of Thailand. Served with Humanity passionate, Demon indulges. Joined with more than 30 brands of Thai Craft Beers, along with Belgian beers from Haacht brewery.